Durability isn't easily defined. It can mean resistance to moisture, dents or scratches or it can mean longevity. Wood floor durability depends on type, species, finish and manufacturing process. Most wood flooring is durable and can stand up to pets, children and a certain amount of abuse, but depending on application, there are differences between products. 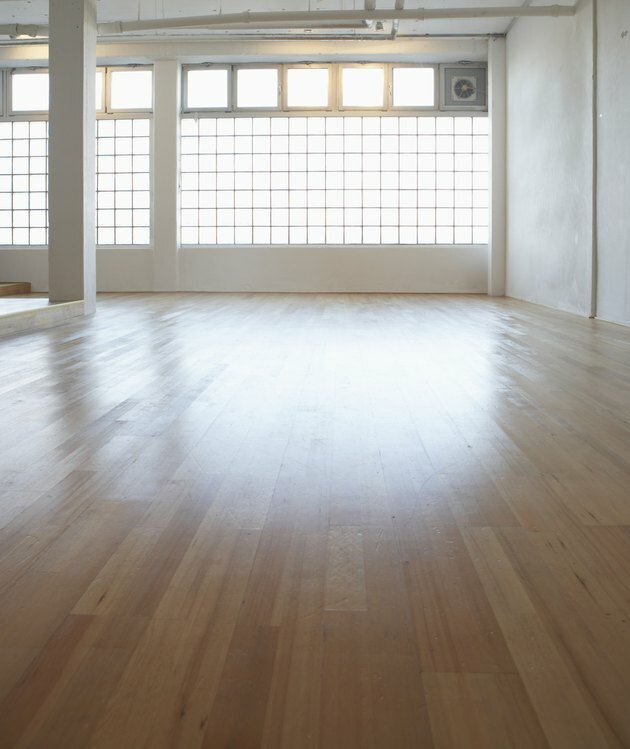 Solid wood wears so well that it is common in dance studio floors. The low maintenance and longevity of solid wood place it near the top of the list for durability. Each piece of solid hardwood flooring is a single piece of wood, typically cut with a tongue-and-groove profile. The most expensive choice among wood floor options, it also provides the highest resale value for a home. With choices ranging from domestic oak, maple, pine, cedar and fir to exotics such as teak and merbau, the options for pattern and color surpass those of most other flooring options. Solid wood flooring can be sanded and repaired over and over again, making it one of the most durable flooring options available. That reparable quality makes solid wood one of the best choices if you have pets with claws or children with toys that could damage flooring. Engineered wood is more durable than solid wood when considering moisture. It resists moisture because of the way it's made, with two or more layers of wood whose grain patterns run at right angles to each other, glued together under hydraulic pressure and then topped off with veneer. Also known as a wear layer, the veneer can vary in thickness. Thinner wear layers, about 1/8 inch, have limited durability, while thicker wear layers, 1/4 inch or more, have better longevity. The thicker the layer, the more times you can sand and refinish the floor. Check with the manufacturer to determine the thickness of the wear layer. You can install engineered wood flooring below-grade, such as in a basement, where solid wood isn't a good choice because of moisture concerns. The Janka Hardness scale ranks wood for density and is a reliable indicator of floor durability in regard to hardness and denting. The higher the rating, the more resistant the floor is to dents, scratches and wear. Red oak, one of the most common hardwood flooring species, ranks 1,290. Brazilian cherry, a more exotic species, ranks 2,350. Black walnut, one of the softer hardwoods, ranks 1,010, while Douglas fir is even softer at 660 on the scale and will scuff or dent easier than a hardwood. Laminated wood flooring is the cheapest option, and the least durable. It provides something close to the hardwood floor look, but the wear layer is often a photographic image and you can't sand it. Laminate flooring is made with a high-density chipboard core, sometimes layered, but it won't stand up to moisture like engineered wood or protect against dents and scratches like solid wood. It's easier to clean because of its uniform, flat surface and it's more economical, but it won't give you the resale value of solid or engineered wood. The finish can make all the difference as far as resisting scratches and dents and adding durability to any hardwood floor. Two types typify hardwood floor finishes. Traditional oil-based polyurethane is flexible, able to withstand the normal movement of wood, and it provides a warm glow to wood flooring. Acrylic urethane, sometimes referred to as water-based finish, is harder and less flexible. Adding urethane makes the resin tougher and more scratch resistant, but water-based urethane doesn't have the solvent resistance and heat tolerance of oil-based products.